Black Widows, are a highly venomous species of spider in the genus Latrodectus. They are well known for the distinctive black and red coloring of the female of the species and for the fact that. The mature female is around 1.5 in long and 0.25 in diameter. She is shiny and black in color, with a red marking in the shape of an hourglass on the side of her very rounded abdomen. Many black female widows also have an orange or red patch just above the spinnerets on the top of the abdomen. The male is either black, or closer to the appearance of the juveniles in color, and is much smaller with a body of less than 1/4 inch. Juveniles have a distinctly different appearance to the adults the abdomen is grayish to black with white stripes running across it and is spotted with yellow and orange. Brown Widows are slightly smaller and generally lighter in color than the black widow species are typically tan to medium brown in color. In some instances, they can be significantly lighter, almost cream colored, while in others they can be much darker brown, almost appearing black. They have the typical widow hourglass marking on the underside of their abdomen, appears to be orange or yellow, on the Brown Widow instead of the red color typically found on the related black widow species. The top of Brown Widow’s abdomen can vary greatly in the way it is marked. Typically it has red or white spots running down the middle of its back. Sometimes it will also have black and white markings patterned down the sides of the abdomen. The legs of the Brown Widow are typically banded with yellow/brown and black. Because brown widow spiders can vary from light tan to dark brown or almost black, they are very hard to recognize! The underside of the abdomen, hourglass marking contains the difference characteristic. A female Black Widow spider can produce four to nine egg sacs in one summer, each containing about 100–400 eggs. Usually, eggs incubate for twenty to thirty days. It is rare for more than a hundred to survive this process. On average, thirty will survive through the first molting, because of cannibalism, lack of food, or lack of proper shelter. It takes two to four months for black widow spiders to mature enough to breed, however full maturation typically takes six to nine months. The females can live for up to five years, while a male’s lifespan is much shorter. After mating, the female sometimes eats the male, earning the name “widow.” The female Black Widow deposits her eggs in a globular silken container in which they remain camouflaged and guarded. Brown Widows can be located by finding their egg sacs, which are easily identifiable. Having pointed projections all over and they are sometimes described as “tufted”, “fluffy”, or “spiky” in appearance. Eggs hatch in approximately 20 days. Female brown widows lay about 120-150 eggs per sac and can make 20 egg sacs over a lifetime and are very timid, and do not defend their web. The Black Widow spider is perhaps the best-known member of the genus. Its bite is dangerous because of the neurotoxin, which causes the condition latrodectism. 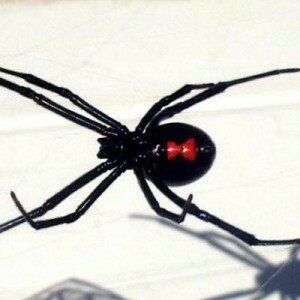 The female black widow has unusually large venom glands and its bite is particularly harmful to humans; however bites rarely kill humans if proper medical treatment is provided. Although these spiders are not especially large, their venom is extremely potent. Compared to many other species of spiders, their chelicerae are not very large or powerful. In the case of a mature black widow female, the hollow, needle shaped part of each chelicerae, the part that penetrates the skin, is approximately 1.0 millimeter (about 0.04 in) long, long enough to inject the venom to a point where it can be harmful. Brown Widow venom is as toxic as the black widow’s. However, brown widow bites are usually not very dangerous; usually much less dangerous than the black widows. The effects of the toxin are usually confined to the bite area and surrounding tissue, unlike the black widow’s. Mere toxicity of the venom is not the only factor in dangerousness. Brown widow bites are minor compared to black widow bites, because they cannot deliver the same amount of venom as the black widow. Brown Widows tend to build their webs in secluded areas around homes, most often very close to where we dwell in our daily routines. Some of the most common areas you would find a Brown Widow consist of empty containers, mail boxes, entry way corners, stacked equipment, cluttered storage, closets, garages, garbage cans, outside chairs, and underneath mobile homes. Black Widow spiders can be found around wood piles, Webs are usually built near the ground (occasionally within dwellings) normally in trash, rubble piles, under or around house, outbuildings, sheds and garages. They can be found under eaves, in storage bins, underneath unused construction materials, inside wooden toy boxes, meter boxes, and other undisturbed places. Be sure to take the proper steps to keeping your household safe and healthy. Call Swatter Pest Solutions LLC at 813-245-4853.